The wine called Chianti came originally from just three villages, Radda, Castellina and Gaiole, located between Florence and Siena. Monteraponi is in Radda; the vineyards are at high altitude (from 400-500 meters above sea level), and the wines are carefully made in a very natural way, which is to say no added yeast, nutrients, or malolactic bacteria are used, fermentation takes place in cement tanks, followed by long macerations (even the Chianti Classico is kept on the skins for at least 25 days), the wines are aged in large oak only, and they are not fined or filtered. Only indigenous varieties are used; Sangiovese principally, of course, with the addition of a little Canaiolo and Colorino. These are vibrant, intensely flavorful, thoughtfully made, distinctive wines, some of the best examples of Chianti Classico. 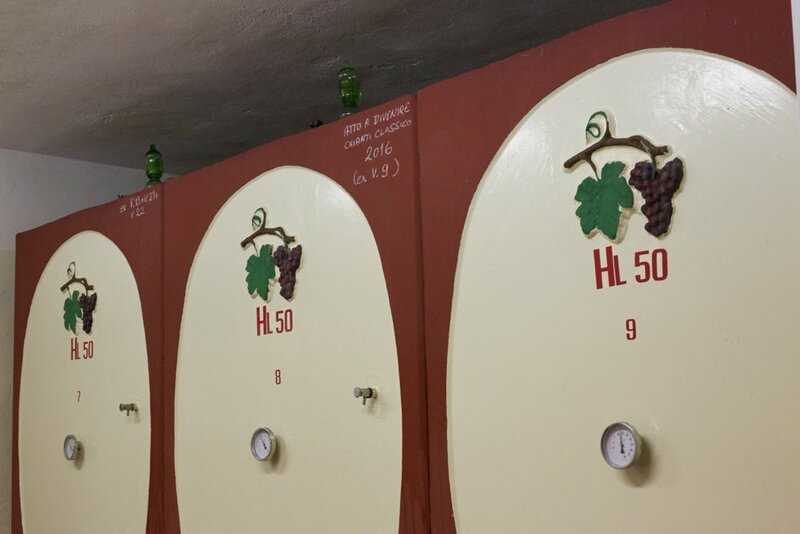 95% Sangiovese, 5% Canaiolo, estate-grown, no added yeast, nutrients, or malolactic bacteria are used, fermentation takes place in cement tanks, followed by about 25 days of maceration, the wine is aged in large oak only for about 16 months, and is not fined or filtered. 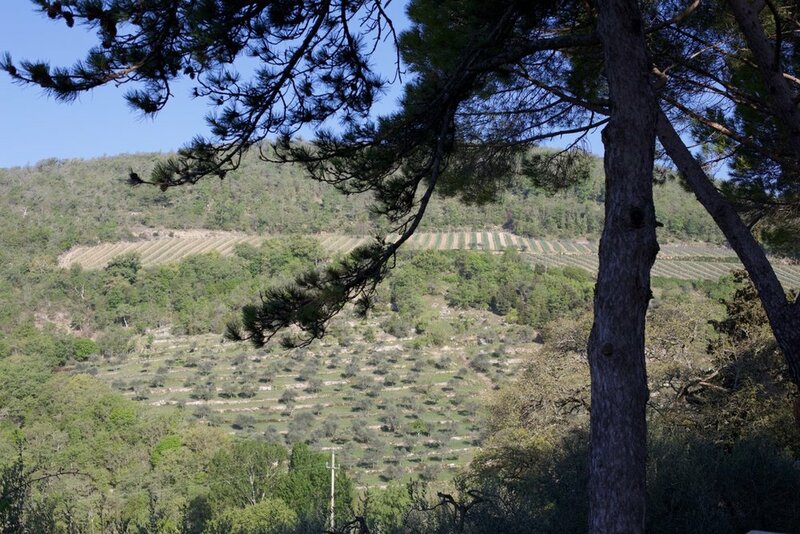 The vines are planted in soils that are 'full of calcareous stones, rich in alberese and galestro’. Bright middling garnet color; aroma and flavor of cedar, sandalwood, red berries, and violets; fresh acidity, long finish. The relatively fresh acidity of this Classico makes it very useful with all sorts of food, red meats certainly but also all sorts of pasta, roast chicken, even salmon. The two Monteraponi 'cru' bottlings are distinctly different. Campitello is perhaps the more classic Chianti Classico, showing red berries, sandalwood, tobacco-leaf and angelica, a bright, firm palate impression, beautiful texture (fine tannins, fresh acidity), drinkable when young but clearly age-worthy. The best Chianti Classico Riservas age easily for 15-20 years, and this is a fine example. Estate-grown, average vine age 40 years, at an altitude of 570 meters (1,900 feet) above sea level, marl/limestone clay soil; no added yeast, nutrients, or malolactic bacteria are used, fermentation takes place in cement tanks, followed by a maceration of around 45 days on the skins; the wines are aged in 3,000 liter oak barrels for 36 months, and not fined or filtered. Beautiful wine, one of the best Sangioveses I’ve had, certainly in the very top rank of Chiant Classico. Middling red color; aroma and flavor full of spices, with tobacco-leaf, sandalwood, and red fruits. Very long, very complex; drinkable on release but will certainly age for at least 15 years. This and a grilled rib-eye would be heaven on earth (or perhaps a porterhouse, for the classic Bistecca alla Fiorentina). The wine will age beautifully for at least several decades.